Industry leaders gathered at a first-of-its-kind conference this week to draft a plan for turning healthful, sustainable food into more of a sales and profit generator for the foodservice industry. If the goal was to create a GPS for making better-for-you-food more of a business generator, the means was letting chefs do the programming. “Chefs shape taste preferences and national food trends, and with that, they are in the best position to make healthy, sustainable foods craveable,” noted Tim Ryan, president of the Culinary Institute of America, which hosted the event in collaboration with the Harvard School of Public Health. The first-ever Leadership Summit, subtitled The Business of Healthy, Sustainable, Delicious Food Choices, launched an ongoing effort in that regard called the Menus of Change program. Its goal is to integrate nutrition, social responsibility and environmental sustainability into an economic force for restaurants. With 60 cents of every dollar spent on food eaten away from home, culinary professionals have more of an influence today on what Americans eat than home chefs do, argued Arlin Wasserman, founder and partner of a company called Changing Tastes. “We have to harness the power of chefs as agents of change,” he said. 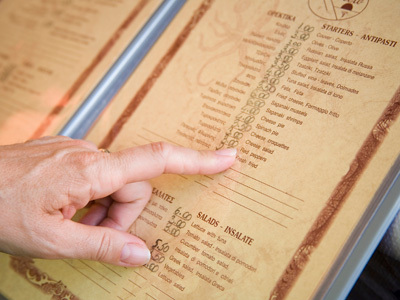 Conference speakers and panelists cited 14 Principles of Healthy, Sustainable Menus, a checklist that can help chefs guide consumers toward better food choices. These include transparency, authenticity, a focus on fresh and seasonal ingredients, portioning food in “right sizes,“ increasing globally inspired plant-based cooking, and ending the low-fat myth. James White, CEO of Jamba Juice, is directing his chain to integrate more whole grains and fresh fruits and vegetables into the menu. Beets and cucumbers are now blended by Jamba into smoothies, and a “make it light option” allows customers to order beverages with one-third less sugar. Jamba is also “building healthy communities,” according to White, by working in school feeding operations. It’s encouraging children to plant gardens so the kids get acquainted with fresh produce and providing healthy snacks. “Healthier people means a healthier bottom line,” he said. Jeremy Bearman, executive chef of Rouge Tomate in New York City, led a cooking demo in which he prepared farrotto, a more sustainable and healthier version of risotto. Farro uses less water to grow than rice and is sourced locally. Bearman toasted the grains to enhance flavor, added pureed mushrooms and mushroom stock for creaminess and finished the dish with a touch of grated Parmesan and a topping of cooked asparagus—no butter or cream. Will Rosenzweig is founder of Physic Ventures, the first venture capital firm dedicated to companies that promote healthy eating. He funded Revolution Foods and helped it grow from an entrepreneurial idea to a profitable business that feeds school children 1 million meals a week, all made from scratch daily using fresh, healthy ingredients. Jorge Collazo, executive chef of New York City public schools, is believed to be the first chef hired by a major city to improve school food. He said he changed his mindset from feeding “students” to feeding “consumers,” creating an environment with a “retail” look and introducing new flavors (garam masala and pesto) and ingredients (kale salad) to the program. “Kids do like green stuff and bitter flavors if you educate them,” he explained. Collazo also does extensive training of his staff so more food can be made by hand. Olivia Wu, community manager of Google food services in Mountain View, California, puts a priority on transparency. “We label the hell out of food” with lots of signage detailing the nutritonals, and every menu in the 30 cafes and other venues can be seen online by 10:30 a.m. daily, Wu said. The size and scope of the dining operation also gives her clout with suppliers. Wu said her most recent success was getting Tyson to raise antibiotic-free chickens to supply Google’s foodservice program.